The Chiswick High Road Action Group (CHRAG) has formally responded to Hounslow’s final call for comments on the proposed Local Plan. CHRAG’s response focuses on the Chiswick High Road area. CHRAG’s representation comprises four responses, the full text of which are presented below. CHRAG believes that the Local Plan document in its entirety uses impenetrable terminology. Its language is in many places vague and ambiguous. There are sentences that are incomplete and difficult to follow, and difficult to relate to the National Planning Policy Framework and The London Plan. These are failures that have effectively excluded ordinary residents and groups from being able to engage properly in the consultation process. CHRAG formally requests that the local authority provide a 2 page executive summary in plain English which will facilitate engagement by the local populace. There are too many examples of incomplete sentences and poor grammar to list here, however CHRAG formally requests that the proposed submission is re-worded where such mistakes have been made. 1) How can “modest levels of growth” deliver housing and jobs? How will LBH secure improved public transport provision (2.38 para 5)? 2) How are planners expected to be guided by the expressed desire for “in a sensitive, thoughtful, yet contemporary manner”? This wording provides no concrete policy guidance for planners or developers. 3) The map on page 35 has no legend to explain the colours, shading, numbers, and arrows. CHRAG as representatives of the interests of Chiswick High Road Residents, users, and business people cannot comment on the soundness of the map, the legal compliance of this section, and how the map might affect the lives of people living and working in the area. 4) Para 2.38, point 2. We have concerns about the proposal to “connect the growth of the Golden Mile” to Chiswick Business Park, and we do not think this is sufficiently explained. What does “connect the growth of the Golden Mile” mean in development terms? 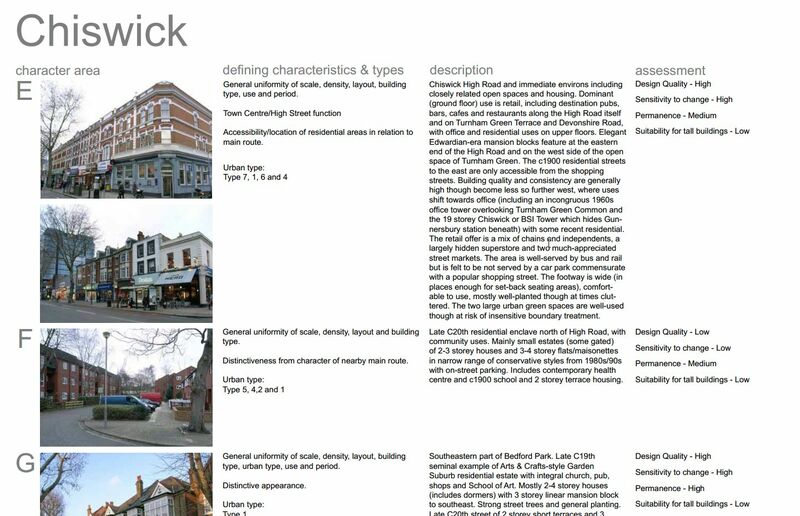 5) While the plan purports to protect the established character of 3 to 4 storey mixed-use buildings and promote sensitive infill (2.38 point 3), it nevertheless encourages redevelopment of major sites such as 500 Chiswick High Road in point 1 of this section in such a way that contradicts the aforementioned aim. For example, in the case of 500 Chiswick High Road, planning has been approved for a 7 storey building where previously there was a 2 storey building with a tall tower on one corner, not to mention the loss of a Victorian residential property as part of this scheme. Regardless of one’s view about this scheme, this is an example of inherent contradiction within the Local Plan. and provide specific examples of what this entails referring to architectural features and proportions, building materials, use of space, etc. 3) The map on page 35 needs to be explained, be annotated with its own legend / key, or provide a reference to another part of the document where this is explained. 4) The Local Plan must explicitly provide that, in the course of any development, the individual characters of conservation areas are retained, such as those of Thorny Hedge Road and Silver Crescent. 5) The Local Plan must be more explicit in its commitment to ensuring that the character and context of Chiswick Town Centre is retained, and that tall buildings are avoided in accordance with the Character and Context Study for Chiswick which illustrates on page 9 the whole of Chiswick’s unsuitability for tall buildings. Development of Empire House area as hotel, office and “larger floor plate” retail accommodation (page 235) suggests an intensity of use inconsistent with the stated goal to “support the diverse mix of local independent shops and businesses” (page 34, 2.38 point 3). CHRAG welcomes development suitable for hotels, offices, and retail, however the reference to “larger floor plate” retail accommodation is not appropriate given the proposed goals in page 34. Remove the reference to “larger floor plate” retail accommodation which would certainly not directly attract local independent retailers according to the Local Plan’s stated objectives. Replace this with wording that secures the Local Plan’s stated objectives, rather than undermines it. Furthermore CHRAG request that the Local Plan explicitly stipulates space for community recreation activities, as well as pedestrian access and enjoyment. At the very least this site should support the council’s stated commitment to support independent business. We also criticise the Local Plan for the suggestion that the Golden Mile should be extended and linked to Chiswick Business Park. The Local Plan, on page 235, should emphasise the fact that the Empire House site falls in an area which is not suitable for tall buildings. Development of the very large site identified on page 235 must be consistent with the special character and context of Chiswick in general and the Turnham Green Conservation Area in particular. The Local Plan should also demonstrate an understanding that areas regarded as unsuitable for tall buildings are equally sensitive to tall buildings being erected in adjacent areas. In the section on Connectivity (10), a stronger case must be made for negotiation and cooperation with TfL and Network Rail to bring about significant improvements to Gunnersbury Station. This must also include improved access especially for the disabled and greater visibility from the main road.